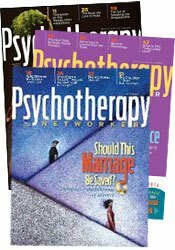 Subscribe to the Psychotherapy Networker at a Special Introductory Rate! Keeping up with the field has never been so easy. Avoid information overload with a single publication that surveys all the latest practice trends. By subscribing to Psychotherapy Networker, you’ll stay at the top of your therapeutic game and even earn CE hours in the process! Whatever your professional goals, the award-winning Psychotherapy Networker magazine provides you with the insight, tools, and inspiration you need to reach them. Each issue keeps you on the cutting edge with the latest developments in the field - plus you can earn CE credit! Subscribe now to get our award-winning magazine now! 1 Year Subscription (6 Issues). Please allow 4-6 weeks for delivery.